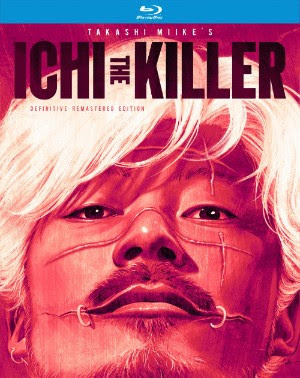 Well GO USA recently send us over information for their upcoming blu-ray release of Takashi Miike's cult classic "Ichi The Killer". The film stars Tadanobu Asano, Nao Omori, Shinya Tsukamoto, Alien Sun and SABU..
Special features includes Audio Commentary with Director Takashi Miike & Manga Artist/Writer Hideo Yamamoto and a still gallery. "Ichi the Killer" hits retail on March 20th.